Homebrewers, get ready for the class of a lifetime! For this installment of 5 Rabbit Cervecería Event Series, Randy Mosher will be sharing his knowledge and experience on "Brewing with Specialty Ingredients". The material covered and class discussions are tailored for experienced homebrewers. 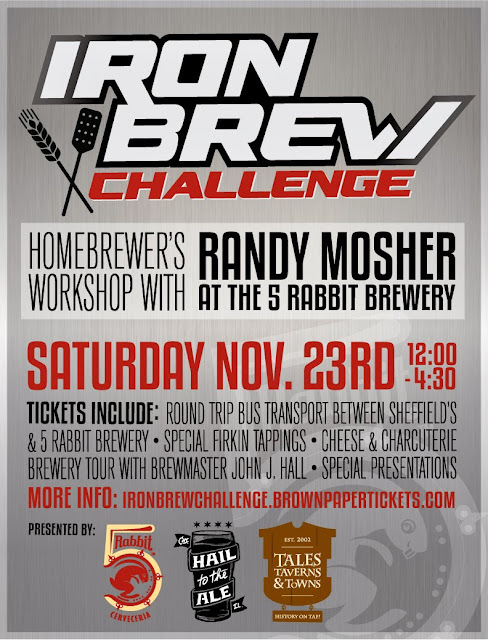 Both installments of this 2-part beer workshop will be held at 5 Rabbit Brewery in Bedford Park, IL. Session 1 will take place on Saturday November 23rd, 2013 at which a "secret ingredient" will be revealed, extending a homebrew challenge. For those wishing to participate, Session 2 homebrew judging will be held on Saturday, February 1st, 2014. Further details to be unveiled at the event. This event is held in collaboration with Kim Leshinski of Hail to the Ale and Liz Garibay of Tales, Taverns & Towns. 12:30pm: Ride to the brewery. Chicago beer history from Liz Garibay of Tales, Taverns, & Towns. 01:30pm: "Brewing with Specialty Ingredients" presentation by Randy Mosher. Randy will also reveal the "Iron Brew" Secret Ingredient Challenge. 03:00pm: Brewery tour from 5 Rabbit Brewmaster John J Hall. Tickets for Session 1 are $45, which includes charcuterie and a selection of cheeses, bread, and tapping of special beers, exclusive to the Iron Brews event. It also covers transportation to and from the brewery from Sheffield's where, upon our return, the good times are open to all.